Home » Posts Tagged "Paper Bead Creations"
Posts Tagged "Paper Bead Creations"
Elegant Paper Bead Jewelry – Not Just For Kids Anymore! 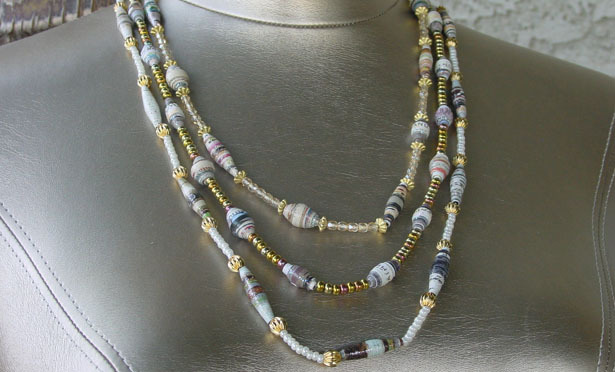 Paper beads can be made into something elegant and fashionable. Wouldn’t you rather wear something that is unique, certainly a conversation piece than some fashion jewelry bought at the mall that will just end up at the bottom of your drawer after they tarnished? 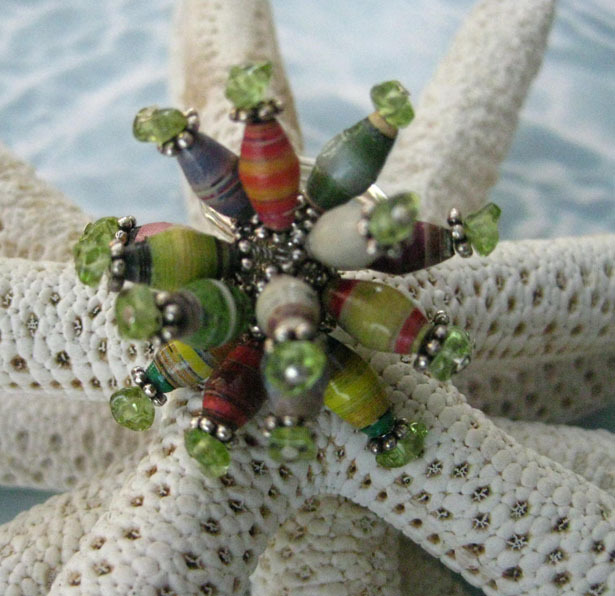 Mix it up with other light inexpensive beads and you cannot even tell they’re paper beads – feel free to look at our gallery and get some ideas. For those of you who already know how to bead you will find paper beads to be an excellent replacement for other beads such as India glass and stones. Paper Beads can be elegant! What to do: Pick up head pin and put spacer and paper beat into it. Make a loop using the Round Nose Pliers, before closing the loop attach it to the one big loop on the ring finding, then wire wrap the tail of the head pin. Continue to do this until you have no space left on the big loop on the ring finding, but try to squeeze in as may head pins with the bead onto the loop as much as you can – this makes the ring stand up and look full, or you can just put in 6-10 of the head pin with the paper bead, the result is that the beads will lay flat and has a lot of movement. I can say I have come a long way turning paper beads into jewelry – rings, necklaces, earrings and bracelets. I look at the different colors and patterns of the paper beads and my mind races along with what beautiful jewelry I can make out of them. Today, I came up with the Necklette – a necklace with magnetic closure that can be easily converted into a bracelet. I find that it is easier to string them with a silk cord and clam tips – once you have practiced doing this, you will be able to make one in 15 minutes (as long as you already have your color pattern). I think this is a great item for fund raisers and craft shows. Step by step procedure or youtube video. We now have an updated tutorial: How to use a “METAL” Bamboo Paper Bead Roller. And it is available for purchase at Aubrey’s Beads: Metal/Bamboo Paper Bead Roller Kit. Watch our video on how to make paper beads, using the bamboo paper bead roller. It is fascinating to watch a pattern unfold as you are rolling the strip of paper into a bead – I think this is what makes this craft so appealing to those who are looking for a hobby and those who actually make a living out of making paper beads. It is not just for kids anymore, the many things you can do with paper beads – the possibilities are endless! We hope to walk you through the process of making them yourself! 1. Paper beads have larger holes than most beads; spacer beads would be good between paper beads. 2. Mix paper beads with other inexpensive beads such as seed beads, druk beads and fire polished beads. 3. For stringing materials the following can be used; hemp, cotton thread, silk thread, leather or any type of yarn that will go through the hole. 4. Paper beads are good for triple stand or more because they are very light.